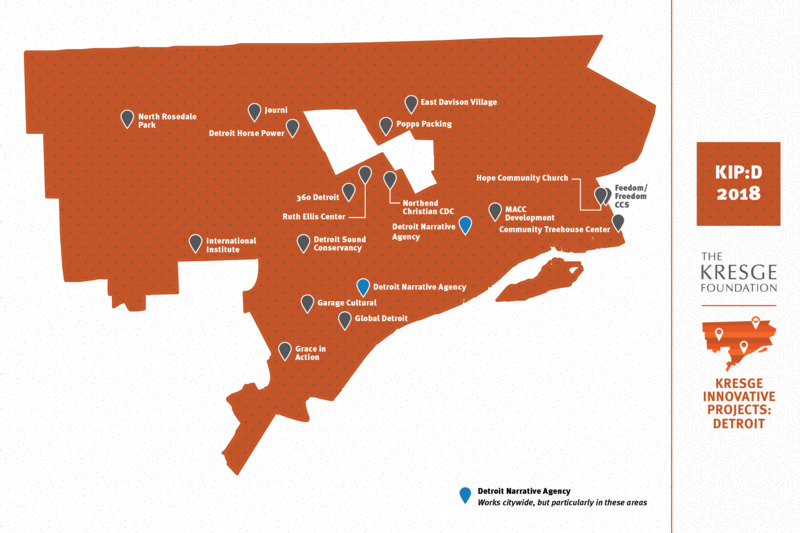 DETROIT - The Kresge Foundation, a private national foundation that works on community development in Detroit, announced $1.5 million in grants for 18 new projects and planning efforts to revitalize Detroit neighborhoods. The grants are the first toward a $6 million, three-year relaunch of Kresge Innovative Projects: Detroit, which ranges from the revival of vacant buildings to the reclamation of blighted properties. The organization's relaunch builds on a $5 million, three-year pilot phase that supported more than 50 planning and implementation efforts. "Detroit's true revitalization means the broad revitalization of its neighborhoods," said Kresge President Rip Rapson. "That requires a multiplicity of tools and interlinked strategies. This relaunch of Kresge Innovative Projects: Detroit is rooted in the same principles as our recently announced support for the mayor's Strategic Neighborhood Fund, our operating support for community development organizations, our Hope Starts Here partnership with the W.K. Kellogg Foundation to make Detroit a city that puts children and families first, and the full suite of our work in the city. We will continue to work with partners to make this broad revitalization a reality." Vacant lots will transform into a new park with picnic tables and play equipment in Virginia Park's neighborhood, while new retail space will be created in Southwest Detroit, and the sports, health and wellness facilities of North Rosedale Park will be renovated in Northwest Detroit, among other renovations. According to Wendy Lewis Jackson, who is the managing director of Kresge's Detroit Program, the latest projects were picked from 178 applications and recognized the people's imaginative thoughts. "They know the strengths and the challenges of their streets and blocks. They know the geographies and they know the people. Their ideas are shaped by their neighbors, and we're proud to provide them with financial and technical support," she said.